Today was the last day of the school year for my two boys. SUMMER! My daughter and I were finished last week but I have been looking forward to when we were all here – out of school – and without commitments to really start prioritizing me. Instead, I feel like I’m wandering around the house not sure of what I should do, afraid to eat anything that isn’t a vegetable, and the only “workout” that sounds good is going to the pool for a few hours with my boys. Is there such a thing as an end-of-the-school-year-funk? Because I think I am in it. Or maybe it’s an I-just-turned-42-and-still-haven’t-gotten-rid-of-this-weight-funk. Either way, I’m trying to climb out of it. I want to start logging my blood sugar levels regularly, keeping a food journal (Really? Do I? ), and recording my workouts. Maybe the more appropriate thing to say is that I want to want to do all of that. I’ve been in this weight loss battle before. I know how hard it is. I think that is what is holding me back from jumping in with both feet, ready for the icy plunge. I haven’t had a lot of success. How many times do I have to be unsuccessful before I just accept that I will always be fat? I don’t want to always be fat. I hate HATE this body. My dad’s health problems have given me a front row seat to my future if I cannot get a handle on this now! In the New Testament, more than once, Paul preaches about finding strength in our weaknesses through Christ. Perhaps, many believe this only refers to a spiritual strength, but I believe that every weakness we have, whether it is a penchant for sweets or for shoplifting doesn’t matter, but all our weaknesses are an opportunity to lean on the Lord. He gave me this body as a gift. He has even given me guidelines on how to treat it. He has given me weakness so that I can learn to depend upon Him instead of on the hand of flesh (which is a fancy way of saying not to be a slave to physical cravings and desires). I used to have a great love of Diet Coke. My body was dependent upon that cafffeine every single day. I didn’t really want to give it up. I loved my habit, but I knew it wasn’t good for me. I knew that I needed to follow the Lord’s counsel to not be addicted to anything. I needed to. I tried and gave up several times. Then something clicked and I stopped. Now it’s been about six years since I have had caffeine. I feel better and I don’t really miss it. Part of me whispers that if I can replace my love of Diet Coke with a love of drinking water, then I can definitely make the sacrifices and changes I need to get rid of this weight. But it is a whisper and sometimes there are really loud doubts trying to get my attention, too. I am going to trust in the Lord. Trust that He loves me, one of his spirit daughters, and that He will help me to find the strength I need to overcome my weaknesses, those weaknessess that keep me from getting rid of my fat. Prayer and scripture study is my goal for this week. If I rely on the Lord then everything else will come naturally. Wish me luck…or better yet, I’d appreciate any prayers on my behalf. A topsy turvy week and my eating goes to pot! No excuses except that I didn’t plan and didn’t prepare and really didn’t care. I stand here 2 lbs heavier. I yo-yo these pounds over and over again. I am thankful that I have this blog to confess to so I regroup. I know I said I was going to before, but obviously I’m on a decline right now. I am in a funk! I even made a cake – what was I thinking?! 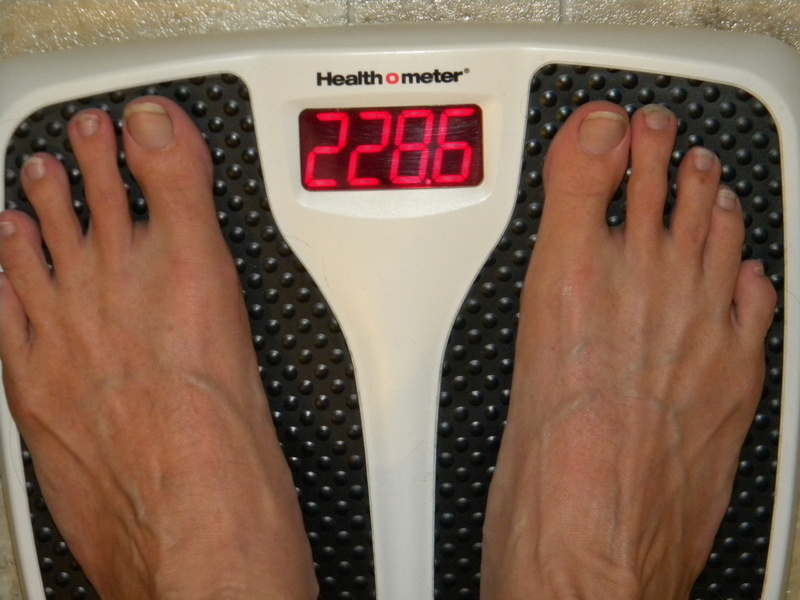 And even had a couple of bites after I weighed in…now what kind of thinking is that? The kind that will throw me into a complete tailspin. I am overwhelmed! I need to step back and take things from the beginning again…again. I am back into my still-tight but at least I can button them pants. I am an emotion eater it seems. So what can I do when things get me down, set me back, upset me to the core? Well, being Christian, I have to acknowledge the He is the way…but practically, what does that mean? I haven’t included my diet in my prayers…I wonder why I decide this is an area I don’t need Him. Why would I think I could handle it all on my own when it’s obvious time and time again I cannot. So in starting over, I will start with a daily prayer to help me in this area. To get to know me even better; that God would reveal to me the way to a healthier me. I think it’s an area I would rather just brush over but I think deep reflection is the only answer, since this circular trip I am taking isn’t the path I want to stay on. I am heading to the treadmill to do a little walking (still congested so no running). If I do no other exercise I will get at minimum 30 minutes on the treadmill (or other location) every day . I have an extremely busy week, so even 30 min is going to be hard to get in. I know I should do more, but this is what I’m holding myself to. I will have a shake every morning…so no special pumpkin french toast because I found it on pinterest and really want to try it. (yes I did last week). I will include fruits and veggies as my snacks every day. I will have a sensible meal for dinner – this might be harder than working out every day because, like I said before, it’s going to be a crazy week. I am looking for crockpot recipes to fill in my week planner so I will have no need to hit fast food (which I also did many times last week). I will get going on the projects that are overwhelming me to the point of doing nothing. I will step back with them and make out a plan of action and take it day by day. This is my plan for this week. Next week I hope to take it to the next level. I have one area that I did succeed in…no candy! I have been tempted but I have said no! I think that’s kept my gain to only 2 lbs. So I sit at 173. I would sure love to see the 170’s disappear for good. May God help me through it!